Maths (or math) is fun! It’s especially when kids are given the opportunity to incorporate maths into play. Here are a few fun ideas we’ve tried at home, which introduce mathematical concepts (like number recognition, counting, counting on, addition, counting backwards, subtraction, basic shapes and geometry, volume, and the beginnings of multiplication, division and fractions) to young kids in a hands-on, playful way. 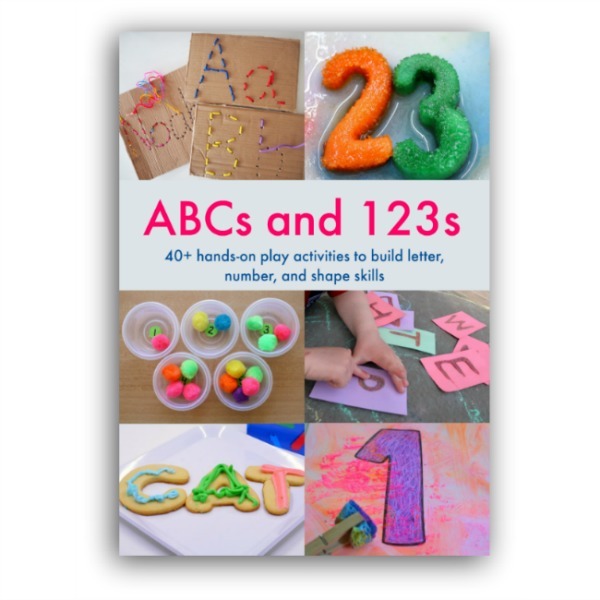 You might also be interested in a new ebook called ABCs and 123s. It’s a collaborative ebook with literacy, numeracy and geometry activities from over 40 like-minded kid bloggers, who believe that kids learn best through play. It will act as a resource for parents (grandparents, carers or teachers) who want to introduce letters, numbers and shapes to their kids in a fun, hands-on and playful way. You can read more about it, and see page examples here. We are also active on Pinterest, pinning all our posts on our Danya Banya board, and math posts that I love from around the web on my Playful Maths for Kids board too. Follow Danya Banya | Go Science Girls’s board Danya Banya on Pinterest. Follow Danya Banya | Go Science Girls’s board Playful Maths for Kids on Pinterest. What are your favourite ways to incorporate maths into play, and play into maths?